While working on another project, a diode shorted out in my Lincoln Electric Welder, a Weld-Pak 100. I needed to replace this diode but finding information online was challenging. To help others, and myself in the future, I am sharing data and specs for the replacement parts I ordered to fix my Lincoln Welder. I knew the issue was a diode and not a transformer short because it still made an arc (very poorly), but became a buzz box with the right sound without throwing the internal breaker. A short in the transformer would likely trip the breaker quickly and not continue to generate an arc. Opening up the weld-pak 100 and testing the diodes with my digital multimeter with it’s diode setting quickly identified the problem diode. To do this you have to first remove the diodes from the aluminum plate that acts as their heat sink (or at least the output wires from the plates). If you don’t know exactly what you are doing to be safe, do NOT attempt any kind of repair like this. Always unplug, and check (verify with a meter safely) that any and all capacitors are discharged fully before testing or working on any electronic device. I’m sharing this info, primarily to have the data easily accessible should I need to replace or repair my welder again in the future. The Lincoln Weld-Pak 100 diode replacement is a huge PITA. There is not one smidge of extra wire inside to allow things to move freely making it challenging to work on. In addition, the transformers are made from wide aluminum strips, and it’s pretty much impossible to move this aluminum strip in the wide direction. The trick I found to getting the diodes out (they are attached to the rectangular aluminum plates on the left bottom of the above photo) is to undo all of the bolts before trying to get at them. Removing what passes for the heat sink (aluminum plate pictured above) from the welder is problematic as well. Working on this welder is not easy because there’s not a lot of wiggle room on any of the wires. From a design standpoint this makes sense, least amount of wire will result in the lowest losses. To get the heat sink plates out use a thin screw driver to pry the inside plastic clamp and pull the plate towards the front and then up. I broke off one of the little tabs that locks the plate in place due to prying a bit too much. Thankfully there are two on each plate. Above is a side by side photo showing the original diode on the left and the replacements I ordered on the right. The original rectifier diodes used in the bridge rectifier assembly to generate the DC current used for welding are International Rectofier parts: IR M9661 40RU (reverse configuration) and IR M9661 40U. There are 4 diodes in total, and 2 of each part number making up the bridge rectifier assembly. One of mine was blown, being shorted out such that it allowed electricity to flow in both directions. These diodes are rated at 70A and 300V based on what I could find on the net, in welder forums and user groups. The original replacement parts are available from Lincoln and welding supply companies for about $24-30 each. 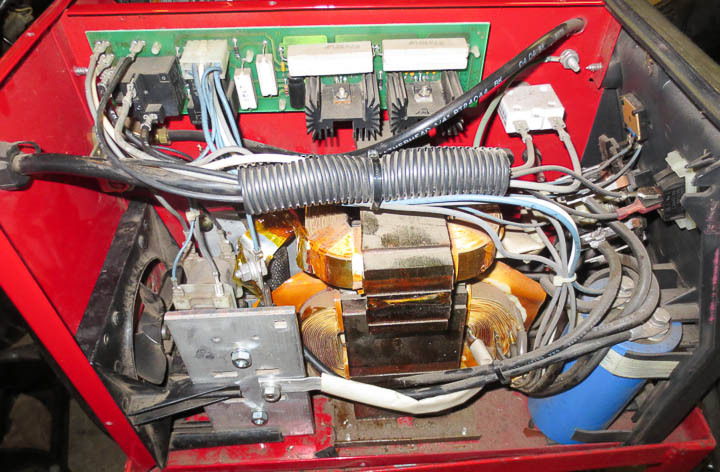 While that is an option, most of the welder forums recommended replacing the diodes with higher voltage ratings as often they blow due to repeated voltage spikes during the welding process. I decided to replace all 4 o the diodes in my Lincoln Weld-Pak 100 Welder. I started my search for replacement parts at Digikey.com (my favorite supplier of electronic parts) but they do not stock higher power rectifier diodes. I ended up finding what I needed at Newark.co. There were lots of options to choose from, my choice might not be the best one. If you follow in my footsteps understand this fact. I as not 100% certain the diode replacement would entirely fix my welder, as such I went with the cheap option. I ordered two Solid State 85HFR120 and two of Solid State 85HF120 diodes from Newark.com with a total cost plus shipping of considerably less then one replacement OEM diode. These diodes had the same form factor as the originals and are rated at 85 amps forward current and more importantly a much higher repetitive reverse voltage max of 1200V. 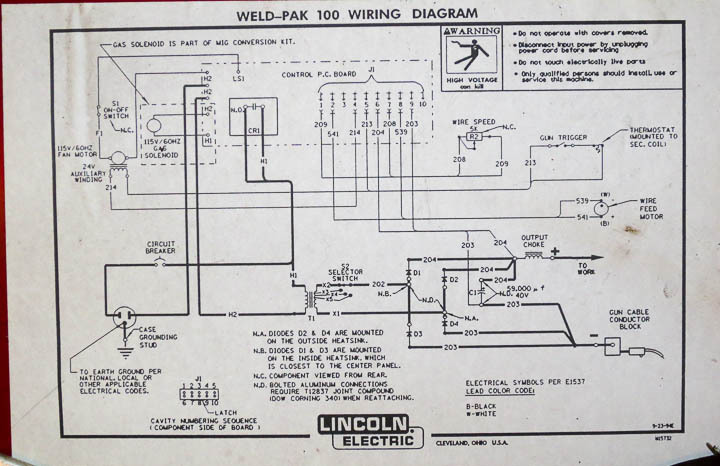 Above is the wiring diagram for the Lincoln Weld-Pak 100 Welder. Thankfully it was inside the welder. When I looked online I couldn’t find a wiring diagram for my Lincoln Electric Welder and thus I’m sharing it here. Sometimes it is nice to find things like the circuit diagram for your Weld-Pak welder before you open it up. In order to get the second aluminum plate heat sink out from the welder I had to completely remove the fan assembly. The plates are supported as well as electrically isolated by the fan assembly so be sure to go careful and not break anything. When you put it back you need to be very careful that everything is floating in air and no uninsulated parts are touching any other metal parts. This welder uses air gap to electrically isolate some of the components. *** Special note *** DO NOT CUT THE WIRES TO THE DIODES! There is no extra wire, you MUST DE-SOLDER the wires, and then put them through the new diodes for soldering! Yes this is not easy, but trust me, if you cut them you will not get it back together without having to replace more things and take the entire welder apart. Replacing the Diodes on the Weld-Pak 100 is pretty straight forward in theory. Desolder the wires from the old parts, solder on to the new ones. You may have to squish the wires while hot with needle nose pliers to get them through the new diodes, or wiggle them in while the solder is melted (using tools not fingers, melted solder is hot). With all of the diodes replaced you are ready to carefully reassemble the diodes and heat sink plates. I’m not sure one way is easier then the other. I put the aluminum plates mostly in place but not fully. This way I could wiggle things into place and then tightened down the nuts. BE SURE TO USE HEAT SINK PASTE ON THE DIODES when mounting to the Aluminum plate. I did not have torque specs on the diode nuts, I just made them tightly snug. Enough so I was sure they wouldn’t come loose, but not tight enough to break anything. Once you have it all back together, be sure to check that you have nothing touching that is not supposed to be touching. 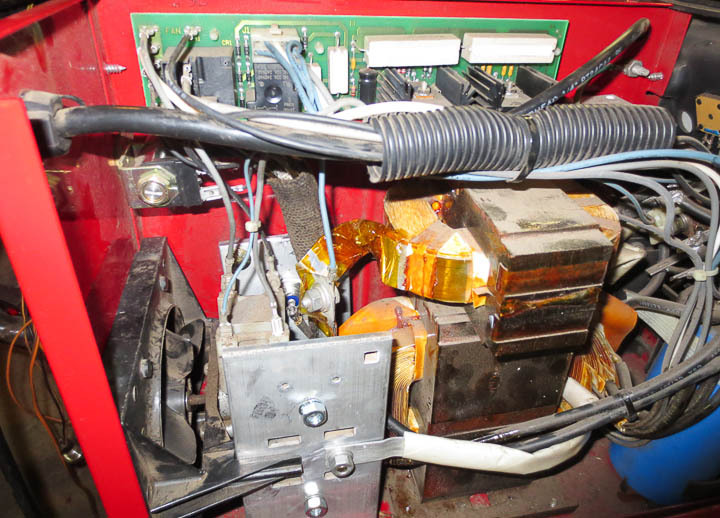 I used a little bit of Kapton film to insulate the transformer “wire” strip on the off chance that something came in contact with it in the future. I loosely layed the cover back on and did some test welding. The welder worked marvelously. I suspect perhaps my diode was iffy for a while as I was once again getting that nice sizzle sound from mig welding. I realized on hearing it I had not heard that sound quite right for some time. The bead of weld my weldpak 100 layed down was perfect. I’ve since welded quite a bit with the repaired welder and everything seems to be great having replaced the rectifier diodes on my Lincoln Weld-Pak 100 Welder. If you found this post useful, let me know, leave a comment. It’s nice to hear someone found my post useful. It was nice to see. This helps. The transformer is bad in mine. Glad it helped. I’ve recently put 4-5 days welding in on my repaired welder. It’s working great, though I find I have to turn my wire speed down from where it was happy before. 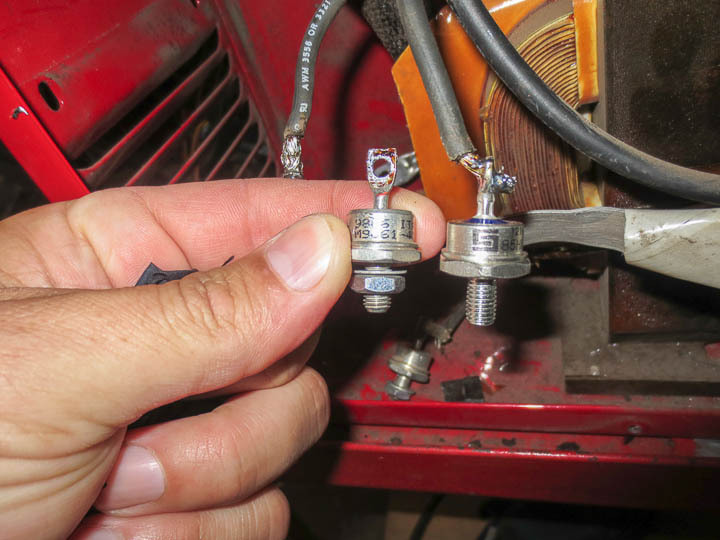 This article helped me diagnose my welder and I did find a bad diode. Opted to replace all four with the ones from Newark as suggested. Did you use hi temp solder for your install? Tried to unsolder the original part with my cheap 100 watt gun (good Weller was at my other shop) and it did nothing. I used whatever solder I had on hand probably 60/40 from radio shack . My welder has lots of welding on the new diodes and it is welding better then ever with no problems. Thanks for this information. I had someone else do the repair but your explanation gave me confidence that what I was being charged for and what was being done was all kosher. Thanks again! Glad you found it helpful! That’s why I share this stuff to help people. It might be you shorted the main transformer or something else is wrong. It’s aluminum sheet wrapped in kapton film as insulator. I have read they sometimes short out. The diodes I ordered are two Solid State 85HFR120 and two of Solid State 85HF120 diodes from Newark.com. Be careful in replacing them correctly, make sure the reverse ones go where the original reverse diodes went. I think I have a bad transformer because it will not spark at all and all my wires are tight and ground is tight but no spark and I do not hear the hum that I usually hear when I turn the machine on. Is it the transformer? and if so should I attempt repair or send to a shop? John, It could be a number of issues. Remember this type of equipment is dangerous! 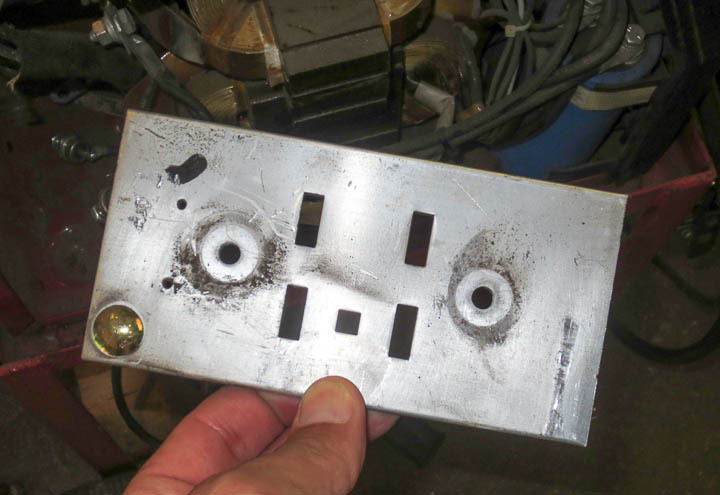 If you do not understand electrical safe practices you should not go poking around in a welder. If you do not understand how to troubleshoot the electronics you should certainly take it to a repair shop to have someone who understands electronics and the dangers associated with poking around inside something like a welder. Electricity is dangerous, and the kind of voltages and currents in some welders can kill you if you make a mistake or are dumb. Zac!!!!! You are awesome man! Thanks so much for the info and step by step instructions. My weldpak 100 has been beatin up for years, but it kept welding until a few weeks ago. It would make a nasty arc sound when I pushed the trigger. I saw your post and ordered the parts. I bought 4 diodes that you mentioned but ended up just replacing the one that was bad. It was so hard to get the new diode on the wire that I didn’t replace them all. Maybe you could teach us all how to solder these wires to the diodes? I found instructions on youtube on how to test each diode and was able to find the bad one. I put the heat sink paste on before the diode was reinstalled. It looked like the wires that connected to the aluminum plates had the heat paste on them too. I am not sure though. Thanks so much for the info! You are awesome. Brad. Glad you found my post helpful and were able to repair your welder. It’s nice to hear someone found it useful. Inspires me to put up more posts, I’m a good year behind on the sharing. The weldpak 100 is a great little machine, mine prolly has over a thousand hours of arc time on it. Hope yours serves you well. My welder still works great. I can only advise you to spec your components appropriately for your machine. Do a bit of online research if you are unsure. Hey Dustin, I’m not sure what to tell you. The breaker is not tripping, it just shuts down? is that correct? IT might be a relay. or possibly a bad or corroded wire. Thanks Zac for taking the time to put up this guide. I stumbled onto your site trying to diagnose my 100. Same symptoms you listed. I ordered the diodes from Newark. Changed them out and cleaned up inside. As you stated, mine must have been lagging for awhile as well, as i hadn’t heard that good sizzle in a very long time. One problem I did have that I didn’t see anybody had mentioned was my old Weller 8200 at 100/140 watt wouldn’t loose the old solder. I ended up buying a D550 at 200/260 watts which did the job. Never the less your guide was very helpful. Thank you for your time. I’m glad my post was able to help you out. That’s why I share this stuff. Hard to find time these days, I have like 30 posts “ready to write up” and no time to do it. lincoln weld pak 100/// motor runs // hooking direct to battery source. Thanks for all the information provided. I was able to diagnose the problem with my weldpak 100. I ordered the parts earlier today can’t wait to see if it goes back to laying good welds. I’ll post a comment after I do the repairs on my machine. Again thanks for sharing your knowledge. I’m not sure but I would guess this is some sort of issue with the switch, rather then an internal short on the transformer. Especially if you are seeing normal welding penetration in C & D.
What thickness will your weld pak100 weld on a single pass using c25 hard wire with .023 wire. I never used 0.023 wire, I had some 0.025″ wire I would use on thin sheet metal. I almost always welded with 0.030″ and 0.035″ wire. The thickest I could weld well with this machine was only 1/8″. The claims of welding thicker metal seemed exaggerated. I did do a few multi pass preheated 1/4″ welds that held under load on a tractor implement, but it was really a stretch for this welder. Very interesting reading on repair of weld pak 100 . I’ve got problems with my unit ,: I can not control the wire feed rate , it runs at a constant speed regardless of dial setting . Im checking into the Pc board now , appears to be an SCR motor drive , which i,m told cost 160.00 to purchase ! I can buy a new welder from Harbor Freight for under 120,00 ! Any thoughts that might help me ? Hi Jim, I have heard the HF welders are decent. If your speed control is not working I would check the Dial. I be it is a potentiometer and sometimes they stop working. If it’s the electronics you likely need a new board. Check ebay. Sometimes you see parts cheap there. 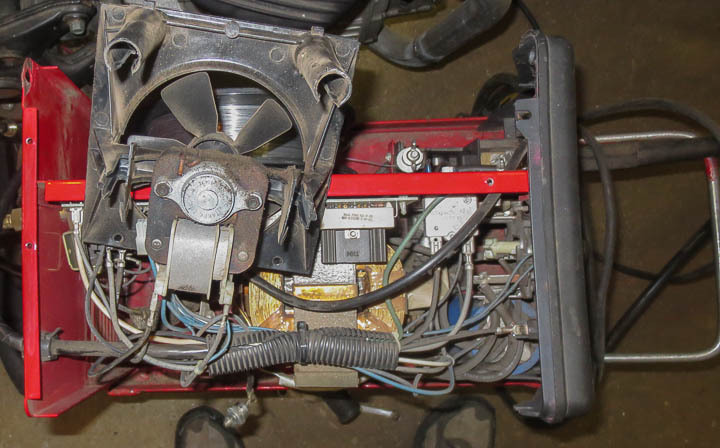 If you have not fixed your welder yet, change out the two transistors on the motor board. They are attached to the black heatsinks. They cost about 4$ each from Newark or digikey. Your info was helpfull but my weld pack 100 feeds wire just fine but no spark or arce ing at all, what could the possible problem be? If you need to ask this, you probably should go to a qualified repair shop to have it fixed. 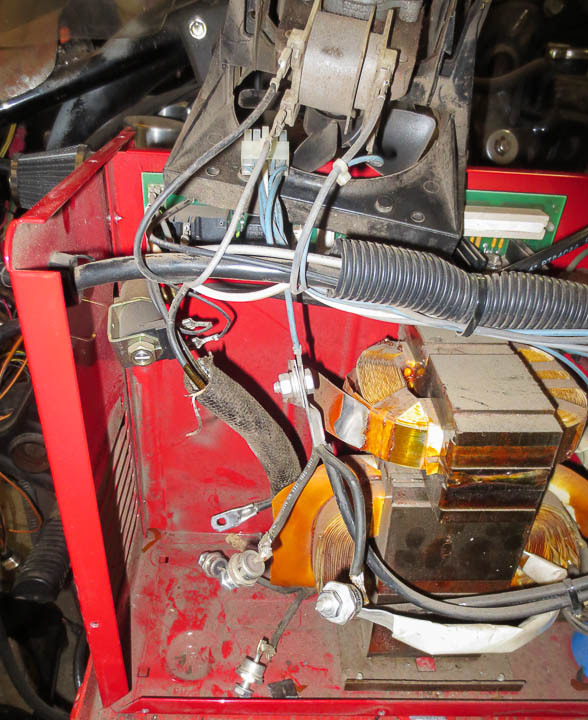 There’s no simple solution to troubleshooting a welder and it can be dangerous if you aren’t sure what you are doing. Zac, I have a HD3200 which exhibited similar symptoms to what you described. low arcing current – not sizzling. I am pretty handy electrically and electronically. ordered the Diodes from Newark like you recommended and installed. still have the same problem. Any ideas. looking at the capacitor and transformer. Also going to take a closer look to make sure diodes are installed in the right order. Maybe I swapped them. Check out your transformer. It may be internally shorted from overheating. If that’s the case you will likely see lower voltage across the electrods when hot than it should be. The specs may be in the manual or you can find them online for your welder. Hi I have a linclon compact mig the 13 amp fuse blows when I strike an arc and also when it’s above settings 3 any ideas? Many thanks in advance for the insights. I have a Lincoln Electric Power MIG 140C.I bought the unit used for my son who will be finishing welding school soon. The following is my son’s input. The unit was working great and has recently stopped working correctly. The open circuit voltage is a 26v and spec says it should be 33v. The unit was also blowing the breaker and the wire was not getting hot enough to form a puddle. Any thoughts as to my units problem? Great information! I just had a weld pac 100 given to me as it was really weak. I bet that the diodes are bad in it also. I can’t wait to tear into it and check them. I have plenty of electronics experience thanks to the USAF. Im to replace diodes on my 100,but my old diodes are copletly rusted. Do you have a way to check witch ones awe the reverse diodes? i have a unit of weld pak 100m can i have the diagram of control circuit board of this model? Helpful! Haven’t replaced yet, but sounds like same symptoms on mine. This advice and four new diodes from Newark fixed my welder. Thanks!! Nicely done write up on how to replace bad diodes. Mine still functions real good. I am setting up mine with a aluminum spoil gun attachment set up. I haven’t got it done yet but a little more work and I will have it done. 85hfr40 and 85hf40 Installed it and its fine. If maybe because the diodes are new, but the welder seems to have a stronger arc. Ive been letting it cool inbetween beads and its good so far. Great job brother I am repairing my brothers weld pack and you just took the long diag time out of the equation. Nice to find good things onlone! God bless you! awesome write up I had the exact problem with mine and local welding supply wanted over $100 for new set of diodes found your write up I ordered parts and my weld oak works excel at again. Thank you. I jumped the gun and removed the easy diodes BEFORE checking which one goes where. Is it safe to assume(? )that the similar diodes connect to same wires from front to the back side diodes? I hope that question makes sense. I bought a welder in an auction and have been looking for pictures of the inside for some time now. The welder was torn apart (didn’t realize that when i bid on it) and I need to reattach the diodes to the alum. plate. The pictures are a God send. They will help me put everything back in its original location. Once it’s back together, I will try to plug in and see what happens. Might be coming back to this for another repair. Thank you for the information!!! I think there was a small solenoid board I had to install along with the gas fitting and parts. IT was a long time ago and I gave my welder to a student/friend a number of years ago when I upgraded to a bigger welder so I can’t go look. Sorry. Thanks to this post, I was able to fix my Lincoln. I used the same diodes. Only issue had was melting the solder with my tiny solder gun. I decided to use my propane torch and worked like a charm. Just had to be careful I didn’t burn anything. Put back together and worked good as new. I have the same welder, lincoln weld pac 100, i removed all 4 diodes and going to order them.But i really need your help, I did not mark the diodes,so the ones ending in RU and U – I dont know where they go! in which position anyway. I cannot seem to find a diagram on the internet that will show me. if you could just open your machine and look inside i would really appreciate that,thanks. Sorry Joseph, I don’t have the machine anymore, I gave it to a junior coworker. im going to try to repair an sp100-t that was given to me. all 4 diodes test open and the plates are missing. ive cut out “new” plates and have your recommended diodes on the way however without disassembling it myself im a bit confused as to where the diodes go? from what i can see from a parts diagram the “R” diodes go on top? (one on each side? ). kind of excited to see if the welder will work! thanks and i share the same “i can fix that or make it better” as you seem to do. fun stuff! yes they do and yes it works! 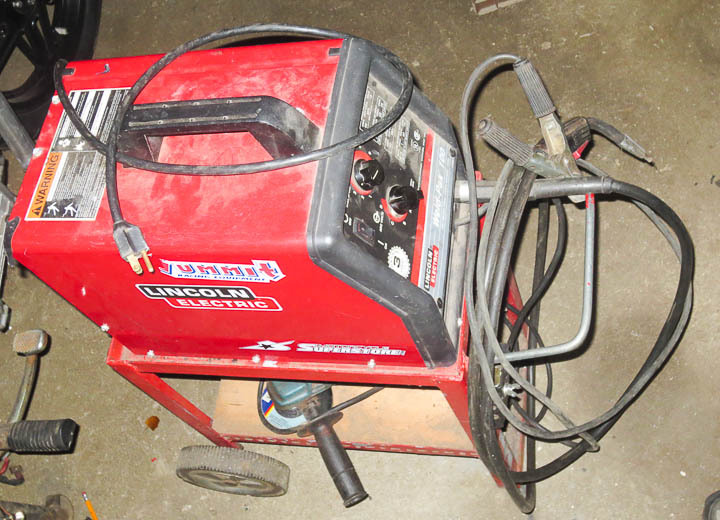 great welder for about a 50 $ chance. it can use gas however i dont think ill make that investment . bought a roll of .030 flux core and it seems to work great! thanks for sharing this info! It just had a really weak arc. It wasn’t melting anything and buzzed with a different than typical sound. Good morning, diodes check good in my Weld pak 100, voltage is 30 volt Dc no load and 15 to 18 volts loaded. Very low arc! What are the chances that the capacitor is weak? Only way i have to test is with ohm meter, it give appearance of some charge or capacitance. Mitch, My Lincoln Wel-Pac 100 had always work just fine until recently. When I pull the trigger there is an ark and then stop. Only an ark! It appears to be a circuit breaker but from everything I have seen of your comments so far everything is a diode problem? Nice article. Can a bad diode(s) result in a loss of arc with fan and wire feeder operational? Is a loss of arc more likely a transformer issue or a bad board issue? I have the Lincoln service manual for my 140c and all voltage readings are OK except the transformer reading is 109VAC when it should read 120VAC according to the manual. Any thoughts as to what a low reading here may mean?